MMA is a full contact combat sport that allows a wide variety of fighting techniques, from a mixture of martial arts traditions and non-traditions, to be used in competitions. The rules allow the use of striking and grappling techniques, both while standing and on the ground. Such competitions allow martial artists of different backgrounds to compete. The term may also be used, less correctly, to describe hybrid martial arts styles. Modern mixed martial arts competition emerged in American popular culture in 1993 with the founding of the Ultimate Fighting Championship. Initially based on finding the most effective martial arts for real unarmed combat situations, competitors of various arts were pitted against one another with minimal rules for safety. In the following decade, MMA promoters adopted many additional rules aimed at increasing safety for competitors and to promote mainstream acceptance of the sport. The name mixed martial arts was coined by one of the developers of these rules, Jeff Blatnick, a former Greco-Roman wrestler and Olympic gold medalist. Following these changes, the sport has seen increased popularity with pay per view reach rivaling boxing and professional wrestling. 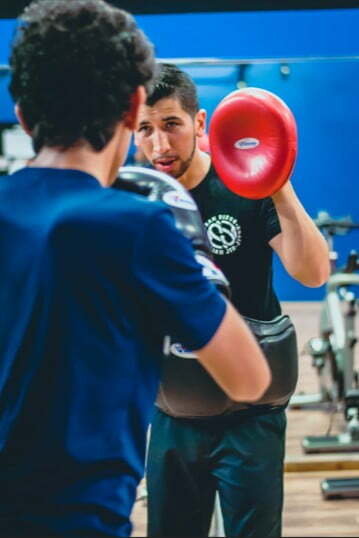 Come check out our quality, yet affordable, MMA training in Escondido | San Marcos area. Call now for a TRIAL CLASS with NO ENROLLMENT FEE!